"We hear you," says Valve. 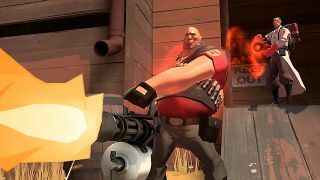 As you may recall, Valve announced matchmaking in Team Fortress 2 as a “high priority” feature back in April last year. It may have taken a touch longer to arrive than expected, however it was finally added to the multiplayer first-person shooter on Thursday. Which is good news, right? Except certain decisions regarding how it’s been added have ruffled more than a few players’ feathers, and have caused Valve to spend the last few days announcing and implementing changes in order to get them back on side. Part of the Meet Your Match update, 6v6 ranked matchmaking was introduced to TF2, alongside a new Competitive Mode. The old ‘Quickplay’ mode was also scrapped, with 12v12 unranked matchmaking Casual Mode taking its place—the latter of which, alongside some pretty gross queue times and players being punished for leaving casual games, seems to have upset certain facets of the game’s players. “We hear you,” said Valve in an official blog post in response to the backlash. “The queue times you are currently experiencing are a bug, not a feature. It is something we are actively working to correct. Several backend issues appeared post-launch that culminated in long wait times. Removing this issue is our highest priority right now. Map selection in Casual Mode is another tweak users should expect in the not-too-distant future. The post also mentions that Casual Mode levels can’t be lost, nor do they affect matchmaking. “We did a poor job of communicating that Casual Mode Levels are in no way similar to Competitive Mode Ranks (which do affect matchmaking, and can be lost),” the post adds, before reiterating that, although not as vocal as it could be at times, Valve is listening to all player feedback across all forums. A Casual Mode patch was rolled out on Friday with another "more comprehensive" one due in the "very near future." It’s also worth noting that the TF2 community still appears to have issues with kicking cheaters and the apparent lack of autobalancing within the now absent substitute system. Fingers crossed that too gets sorted in time.